The arrival of spring is a refreshing moment for fashion and style enthusiasts. Each season has its own unique flair, inspiring wardrobes that match the overall look and feel of that season. Spring in particular is a time of renewal, revitalization, and creativity, encouraging new ideas and exploration. At Szul, we’ve found many of our customers spend this season looking for a brilliant new accessory to complement bold new outfits and seasonal ensembles. While we’re most famous for our selection of elegant diamond jewelry, we also carry a diverse lineup of gemstone bracelets perfectly suited to spring accessorizing. These items combine the classic appeal of precious metals with the bright and colorful shine of the most popular gemstones. Lighter shades are especially appropriate for spring fashion, but any gemstone is sure to add a touch of class to a daring new look or a favorite outfit. 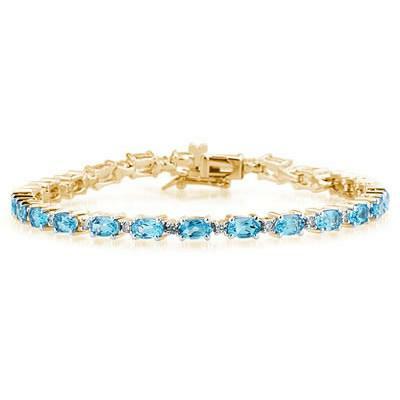 Szul’s gemstone bracelets feature fantastic stones like blue topaz (pictured above), emerald, and ruby, as well as more rare, compelling stones such as tanzanite. Most of the gemstone bracelets on sale in our online jewelry store are available at a significant discount, and our regular customer incentives such as our guarantee and free shipping offer also apply. To view the full gallery of gemstone bracelets and more gemstone jewelry online, visit http://www.szul.com/gemstone-bracelets. This entry was posted in Beautiful, Fashion, Gorgeous, Jewelry, Pretty and tagged blue topaz, emerald, gemstone bracelets, Jewelry, online jewelry store, ruby, spring, szul. Bookmark the permalink. Hi, are you providing gift wrapping facility, as I was hoping that the Gold Diamond with Ruby Bracelet must be delivered directly to my sister’s place.